We seek to develop film projects that convey vivacious and dynamic African-American themed stories free of cliche. Because who needs more cliche in film, music, literature or otherwise, right? Didn't I ask for Tea? debuted in February of 2015 this short film has been making it rounds in many small theaters. 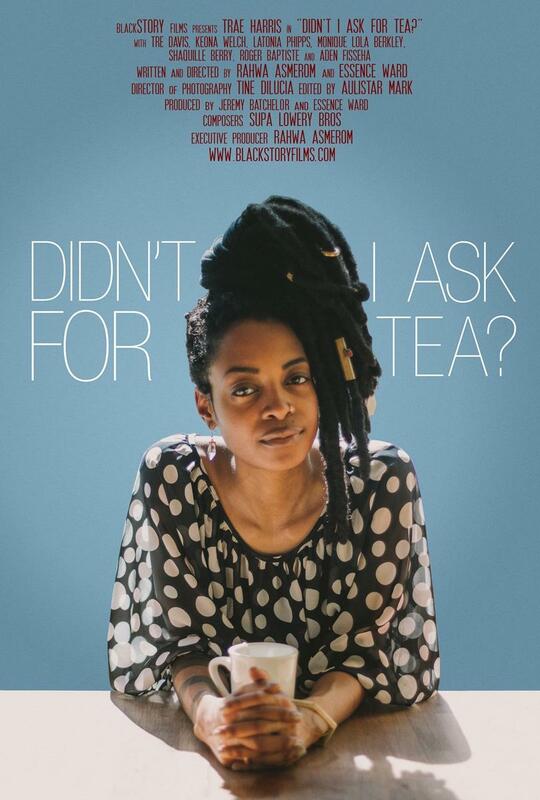 Screened at Brooklyn Museum as part of "Women Changemakers" program, Pan African Film Festival 2015, Black Star Film Festival, Roxbury International Film Festival, Black Harvest Film Festival, Greater Cleveland Urban Film Festival, Rwanda International Film Festival, Paris Black Movie Summer Festival, Reel Sisters Film Festival, Los Angeles Black Film Festival, and the Downtown Urban Arts Film Festival. I expected a romantic comedy, because that's typically the narrative of movies that introduce us to characters while on a date. I was pleasantly surprised when that wasn't the premise of the short. We followed the main character Brandy, played by Trae Harris an actor I was introduced to by her performance in the indie film Newlyweeds. Instead, I got a great story detailing the ills of apartment hunting, the silliness that is dating and great women friendships. I'm a Brooklyn resident so I appreciated the subtle jab at gentrification, and the lack of amenities in neighborhoods of lower income. The different personalities of the women are great and what's a movie about friendship if there isn't a brunch spot? The Brunch spot has become the tabernacle of friends catching up, finding release and staying connected. Im a virgo so my attention to detail is a bit neurotic, and I was bothered by the realtor. The movie is clearly set in winter, and NYC is known for hard winter months. Brandy, the main character was wearing trendy winter fashion yet the realtor never wore a coat! I was highly confused about that. Yes, I know, why am I being petty? Im really not, I just found it strange that he needed no coat, yet there are scenes where Brandy is clearly shivering because it's freezing. So, my only suggestion would be a nice warm men's coat and i'll be satisfied. Please check out what I'm watching, and let me know what you think!